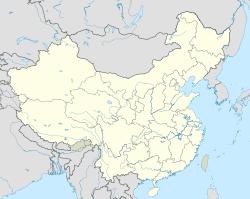 Liuzhou (/ljuːˈdʒoʊ/; Chinese: 柳州, IPA Pronunciation:[ljòu.ʈʂóu]) is a prefecture-level city in north-central Guangxi Zhuang Autonomous Region, People's Republic of China. The prefecture's population was 3,758,700 in 2010, including 1,436,599 in the built-up area made of 4 urban districts. Its total area is 18,777 km2 (7,250 sq mi) and 667 km2 (258 sq mi) for built up area. Liuzhou is located on the banks of the winding Liu River, approximately 255 km (158 mi) from Nanning, the regional capital. By road, it is about 167 km (104 mi) to Guilin, 167 km (104 mi) to Hechi, 237 km (147 mi) to Nanning, 373 km (232 mi) to Fangchenggang, 448 km (278 mi) to Beihai. Swimming in the river is a tradition of the city. The river is normally green, but sometimes in summer, floods from the mountain areas upstream bring sediment which colors the water yellow. In early 2012, a cadmium spill upstream caused serious pollution worries. The river can be deep. Normally, the depth is 60–70 metres (200–230 ft) but can as deep as 90 metres (300 ft) before it floods over the wall. In 2000 a bus, with 78 passengers, fell over the side of a bridge, and into 27 metres (89 ft) of water. Liuzhou has a humid subtropical climate (Köppen Cfa), with mild winters and long hot summers, and very humid conditions year-round. The monthly 24-hour average temperature ranges from 10.6 °C (51.1 °F) in January to 29.1 °C (84.4 °F) in August, while extremes have ranged from −0.3 to 39.0 °C (31 to 102 °F). Rain is both the heaviest and most frequent from May to August, when nearly two-thirds of the annual rainfall occurs. Liuhou Ancestral Hall柳侯祠，"Ancestral Hall of Liu Noble"
The Liujiang men (Chinese: 柳江人) are among the earliest modern humans found in East Asia. Their remains were discovered in the Tongtianyang Cave (通天岩) in Liujiang County, Guangxi. Liujiang man is a Late Pleistocene Homo sapiens sapiens. 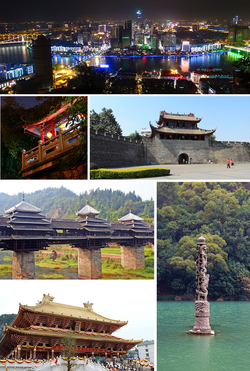 Liuzhou has a history of more than 2,100 years. The city was founded in 111 B.C. when it was known as Tanzhong (潭中; '"Center of Deep Pool"'). In 742 A.D. it became known as Longcheng (龙城; '"Dragon City"'), after the Long River, before finally changing to Liuzhou (柳州; '"Willow Prefecture"') after the Liu River in 1736. The most famous historic figure is Liu Zongyuan (773–819), who was a poet and politician in the Tang Dynasty and who died in Liuzhou. He is commemorated by a park in the city. Liuzhou was the site of Liuchow Airfield, used by Nationalist Chinese and American Army Air Forces in World War II. (At that time the airfield was closer to the centre, where now is the zoo.) It was captured by the Japanese army on 7 November 1944 during the Battle of Guilin–Liuzhou and recaptured by Nationalist Chinese forces on 30 June 1945 prior to the Second Guangxi Campaign. Liuzhou is the second largest city in Guangxi and is the region's industrial center. According to statistics issued by the Liuzhou government in 2015, the city’s GDP was 231.1 billion yuan. As with much of Guangxi, the landscape around Liuzhou is a mix of rolling hills, mountain peaks, caves and karst scenery. It is an ideal base for exploring the minority villages in the area. Rongshui: Rongshui Miao Autonomous County is located in the north of Liuzhou prefecture, 118 km (73 mi) away from Liuzhou and 168 km (104 mi) from Guilin. The territory is inhabited by Miao, Yao, Dong, Zhuang, Han nationality. Dayaoshan scenic area is in Jinxiu Yao Autonomous County, 154 km (96 mi) from the city of Liuzhou. It has a scenic area of over 500 km2 (190 sq mi). Sanjiang lies to the north of Liuzhou near the Hunan border. It is a Dong minority area and is surrounded by picturesque ethnic minority villages. LiuZhou Industrial Museum (柳州工业博物馆) was set up on the original site of the former Cotton Textile Factory No.3, and opened in 2012. Liuzhou Airport provides flights to major cities in China. Liuzhou has extensive rail connections with the rest of China. Hunan-Guangxi Railway (Hengyang - Pingxiang, a.k.a. Xiang-Gui Line), Jiaozuo-Liuzhou Railway (Jiaozuo - Zhicheng - Liuzhou, a.k.a. Jiao-Liu Line) Railway and Guizhou-Guangxi Railway (Guiyang - Liuzhou, a.k.a. Qian-Gui Line) make Liuzhou the center of freight transportation in Guangxi. Liuzhou is the headquarters of the 41st Group Army of the People's Liberation Army, one of the two army groups that comprise the Guangzhou Military Region responsible for the defense of China's southern coast and its border with Vietnam. Liuzhou appears in the Chinese saying 生在苏州, 活在杭州, 吃在广州, 死在柳州. because, in the past, the city was known for its coffins, made from firwood, camphor wood, and sandalwood, which are said to preserve the body after death. Guangzhou's "Cantonese" cuisine is famous worldwide, and Hangzhou is known for its prosperity and the beauty of its location. Suzhou is reputed to have the most beautiful people in China, so the line is sometimes given as "Marry in Suzhou...". Today many tourists buy miniature coffins, about 3 to 30 cm (1.2 to 11.8 in) long, as souvenirs or good luck charms. The coffins are usually inscribed 升官发财 (shēng guān fā cái) which means 'get promotion and get rich". The second and fourth characters are homophones of 棺材 (guān cái) meaning 'coffin'. Some miniature coffins are used as caskets to hold the ashes of ancestors. Liuzhou was the home of Li Ning (born 1963), gymnast and entrepreneur who lit the Olympic torch in Beijing in 2008. Chinese gymnast, Jiang Yuyuan was also born in Liuzhou. ^ "Liuzhou pronunciation". Dictionary.com. Retrieved 25 April 2015. ^ Shen, G.; Wang, W.; Wang, Q.; Zhao, J.; Collerson, K.; Zhou, C.; Tobias, P. V. (2002). "U-Series dating of Liujiang hominid site in Guangxi, Southern China". Journal of Human Evolution. 43 (6): 817–829. doi:10.1006/jhev.2002.0601. PMID 12473485. ^ a b Hump Express, Vol. 1, 25. "Liuchow Victory Complete as Chinese Force Enters Smashed and Burned City Archived 2012-04-25 at the Wayback Machine". India China Division, Air Transport Command, 5 July 1945. Wikimedia Commons has media related to Liuzhou.